A while ago, I posted a tweet on how to tackle one of the largest challenges of Universal Basic Income (UBI) or its cost. Most calculations today rely on two things: removing the existing welfare structure (social, housing, education) by replacing it with UBI and a slight increase of taxes on top of it. As the removal of existing welfare is not enough, usually a slight increase of 2-5% would be needed. The additional option is to introduce a new type of tax on properties or land ownership — only for those that are above a certain value. Zero marginal cost describes a situation where an additional unit can be produced without any increase in the total cost of production. In his book “The Zero Marginal Cost Society,” Jeremy Rifkin describes how the emerging technologies of the internet and communication through everyday devices will speed us to an era of nearly free goods and services. This trend will create a global collaborative society and the transformation of capitalism into something new. All this could create an abundance of goods and services for a fraction of the cost that is necessary now. By adding limitless amounts of energy (9.) and adding self-governed A.I. computational power — prices will truly drop to zero . When the cost of living is constantly dropping, the amount needed for UBI becomes more achievable. The government is powered, but not controlled, “KickStarter-like” scheme, in which additional sources necessary for the payment of UBI income have been found in certain types of collective ownership of companies. This system has the additional advantages of encouraging collaboration, communication, and transparency, therefore backing up the direct democracy model and allowing people to find solutions together for hard problems, such as global warming. This schema is similar to the retirement funds that are operating currently. Additional increase of available money could be gained by A.I.-powered funds that would not require significant personnel. As there are algorithms that are replacing brokers, we can envision that it would be possible to replace remaining investment funds personnel. Unlike pensions and investment companies, UBI investment funds would work for everyone equally. They showed the scale of the tax evasion scheme: just in Amsterdam (Holland, Netherlands) in the year 2013, 14,668 companies that were registered there for the sole purpose of evading taxes. The total amount of money flown at the end of that year was $7.861.000.000.000 — more than 10% of the world’s GDP for the same year. Finding ways to bring that money back into the legal money flows could allow us to get to the level of funds necessary for UBI without an additional increase of existing taxes. Social-private ownership is the new type of ownership mentioned in the explanation of the Basic Tax Control schema. This type of ownership is neither government nor private ownership. It is "Public" or rather "Social-private" ownership. The government cannot sell or control that type of ownership, only give policies and laws that will control possible fraudulent activities. "Social-private" ownership in those companies is not transferable and not inheritable. Upon death, everything that has been under the control of that person should return to the BTC public fund and be dispersed to other members of society. It is obvious that, with every passing year, our planet is getting more overpopulated. It almost seems that we are “testing” what the carrying capacity of our planet is. The land we don’t use for habitats we use for crops and exploitation of mineral resources. 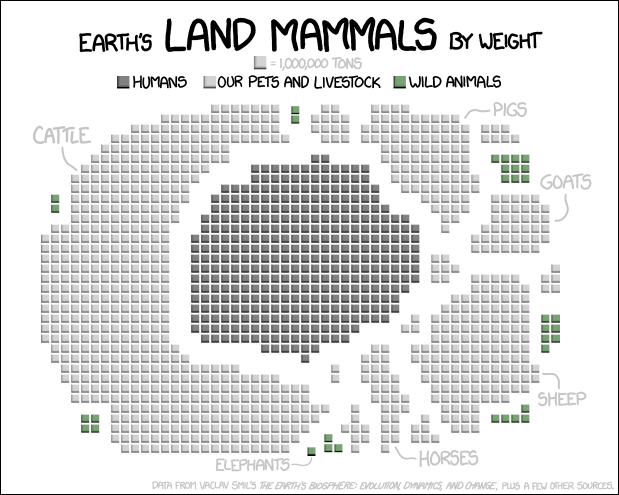 The present human mass, along with the mass of domestic animals, hugely outnumbers all the wildlife on the planet. Some theories say that, by applying vertical farming and new technologies, this planet could carry 2-3 times as many people as it has now. Should we test this premise? Maybe it would be much better if we find a balance and a way to live with nature in harmony by reverting to a sustainable number that we will be able to maintain easier. From the point of automation, it would be much easier to meet the needs of a smaller population. Studies have shown that richer societies tend to have fewer children. In that sense UBI could help significantly. UBI could remove poverty, which could then potentially have a population reduction effect. I will return to this subject in some other article. To Be Continued... read about other ways to fund UBI in next article. If you found value in this article, and you would like me to continue writing, you can support me with a monthly patron pledge of $1+, the same pledge will also support project to create a blueprint for a corporate implementation of Basic Income while fighting Global Warming.